For three years in a row, Tracktwo has co-organised a “China Day” during Almedalen Week. Almedalen Week is Sweden’s most important political forum and takes place every year in July in Visby on Gotland island. During the China Day in 2015, the topics discussed included: Where is Xi Jinping’s China headed? War or Peace in Asia? China’s economy – ten more good years? China’s environmental crisis – how bad is it? Is sustainable and responsible business in China possible? New citizens and policy entrepreneurs – the role and impact of civil society in China. A great number of distinguished panelists and China experts participated in the full-day event, including Kristina Persson, Swedish Minister of Strategic Development; Ulf Kristersson, shadow Finance Minster and economic spokes person of the Moderate Party; Börje Ljunggren, author and former ambassador to China; Isabel Hilton, founder of Chinadialogue; Lars Danielsson, Swedish ambassador to South Korea; Marie Söderberg, professor at Stockholm School of Economics; Stein Tönneson, professor at Uppsala University; Kristina Sandklef, macro economist; Karl Hallding, senior researcher at Stockholm Environment Institute; Annika Rembe, Director General of the Swedish Institute; Mats Harborn, Vice President of the EU Chamber in China; Hanna Sahlberg, Swedish Radio China Correspondent; Jerker Hellström, Security policy analyst at the Swedish Defence Research Agency; Thomas Lagerqvist, Chair of Sweden China Trade Council; Karin Wessman, sustainability analyst at the Swedish Export Credit Agency; Tomas Larsson, managing director of Kairos Future China; and Pierre Börjesson, global sustainable business expert at H&M. 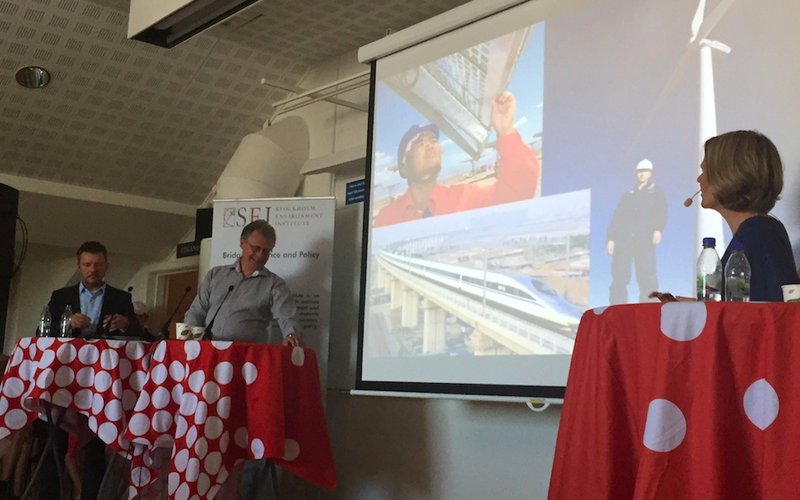 We are proud to have organised the most comprehensive and insightful China seminar in Sweden for the third year in a row. As stated by one of the co-organisers, “one year is no year, two years is two years, and three years is a tradition.” We look forward organising the China Day in Almedalen again in 2016! For more information about the event (in Swedish), please visit the China Day website.